Bob and Cheryl Rabbitt's waterfront getaway in Sherwood Forest, Maryland, has provided a scrapbook full of summer memories for their family since they bought the cottage in 2002. Situated a mere 20 miles from their primary home in Annapolis, the 1992 cottage is set on the Severn River in an established, almost century-old enclave of 400 homes. The now highly coveted development broke ground in 1913 and has rewarded its loyal population with unending camp activities and contagious camaraderie ever since. Lessons in sailing take place in the nearby waters. Neighbors know each other. A general store delivers daily necessities. The community has modern amenities but is charmingly arrested in time. When Bob and Cheryl decided they and their four children had outgrown their Annapolis home, it didn't occur to them at first to occupy their getaway home full-time. (Even though Sherwood Forest is alluded to as a summer community, 65 percent of its residents stay there all year.) They shopped around elsewhere for a property that was a move up in size but couldn't find anything that suited them. Beautiful Annapolis neighborhoods yielded plenty of workable houses, but the people who lived in them seemed to vanish once the automatic garage doors closed. The Rabbitts kept returning to the thought that they wanted the sort of community vibe that their summer place provided--children playing outside, neighbors walking their dogs and stopping by to engage in chat. That's when it dawned on them that with so much fun to be had in Sherwood Forest, it would be a shame to leave the friendly compound every year just because days were becoming shorter and the lush green lawns of summer were giving way to the fiery foliage of fall. So the Rabbitts decided to extend their stay--permanently. "We could have bought a house anywhere," says Cheryl. "But it wasn't just about the house. We were more interested in finding a neighborhood where people wanted to know each other and get together. Then we could always adapt the house if necessary." So they ceased their hunt, committed to Sherwood Forest year-round, and pushed to complete a full, yearlong renovation. A former television reporter, Cheryl tackled the plans as she would an in-depth news story. Photos of residential exteriors, fabric swatches, and paint samples were assembled, filling files that she and Bob carefully perused in order to develop an aesthetic they could relay to the team of professionals- they hired, a talented trio composed of architect Catherine Purple Cherry, interior designer Kelley Proxmire, and builder Burt Winchester. The couple understood not only that the architecture of the house required an expansion to comfortably lodge their family and its full-time activities but also that the exterior should retain the look of the coastal Northeast, particularly the shores of the Severn River. The interior presented a challenge, too. The house was outdated when they bought it. Boxy rooms and small proportions were passable for finite days spent during the summer months, but they wouldn't suffice for the comings-and-goings of their sporty young family all of the time. The updated plan of the house included an expanded second floor with bedrooms custom-designed to reflect each child's personality and a modern open layout on the first floor. Rooms now coordinate so seamlessly that it is difficult to tell where one ends and another begins. The main level of the house features a living room punctuated with several sliding glass doors. When open, the doors expand the living room's size by joining it to a welcoming screened entry and dining porch. "The whole purpose of living in this picturesque location is to take advantage of the outdoors when weather permits," explains Cheryl. "The sliding doors allow us to move freely between the living room and the outdoor dining space, where we frequently take our meals." To enhance the serene and scenic outdoor environment, the interior palette had to blend with the river that flows only steps away. 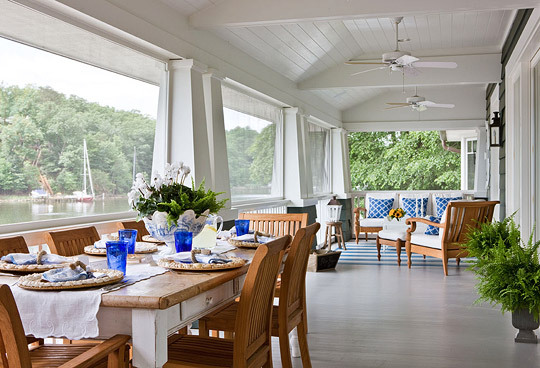 Enter blue-and-white, that perennial favorite palette for waterfront homes. An updated scheme makes the main-level rooms appear as though they have been engulfed by an ocean wave--pretty cobalt, royal, and French blues drench furniture, fabrics, and walls. The only color addition is in the French Country kitchen, where notes of yellow create spirited accents on the wall, the bar stools, and the comfy, cushy window seat. Sherwood Forest is no longer an excursion for the Rabbitt family, but a place where they are thrilled to spend 12 months a year. "Our plan was to create a home our kids would want to return to with their families when they are grown," says Cheryl. "We had already lived in this house before, but it has a whole new life now. All of the aspects that we once appreciated for only three months a year we now celebrate every day." Architect: Purple Cherry Architects, One Melvin Ave., Annapolis, MD 21401; 410/990-1700, purplecherry.com. Interior design: Kelley Proxmire, Kelley Interior Design, 4519 Wetherill Rd., Bethesda, MD 20816; 301/320-2109, kelleyinteriordesign.com. Kitchen design: Mark White, CKD, Kitchen Encounters, 202 Legion Ave., P.O. Box 6485, Annapolis, MD 21401; 410/263-4900, kitchenencounters.biz. Builder: Winchester Construction, P.O. Box 351, Crownsville, MD 21032; 410/987-5905, winchesterconstruction.net. Dining chairs ("Chelsea Side Chairs"/Natural Teak #C014; "Chelsea Armchairs"/Natural Teak #C015): Kingsley-Bate Ltd., 703/361-7000, kingsleybate.com. Sofa ("Armada" #3330-6300): Brown Jordan, 800/743-4252, brownjordan.com. Striped floor: Fine Art Finishes, 202/544-3142. Table; shell chargers: owner's collection. Blue plates: Ralph Lauren Home, 888/475-7674, ralphlaurenhome.com. Covered in a Manuel Canovas solid cotton fabric, Brunschwig & Fils chairs in front of the fireplace circle a Charles Stewart ottoman where the kids play board games. The striped ottoman fabric is from Schumacher, and the rug is from Stark Carpet. Four upholstered chairs ("Claremont Chairs" #32/48532.08); trim on chairs ("Dorsett Gimp"/Indigo #39081-282): Brunschwig & Fils, 800/538-1880. Ottoman (#6101-40): Charles Stewart Co., 828/322-9464, charlesstewartcompany.com.Ottoman fabric ("Nautique Stripe"/Blue #50680): Schumacher, 800/523-1200, fschumacher.com. Trim for floral pillows (#T30343-1): Kravet, 888/457-2838, kravet.com. Wall sconces ("Original Wall Storm Lights" #W4-040, by Besselink & Jones): Blanche P. Field, LLC, 800/895-0714, blanchefield.com. Area rug ("Conway"/sisal): Stark Carpet, 212/752-9000. Drapery ("Panama"/Bianco #84206-01); drapery contrast fabric ("Liso Jerez Woven"/Esmalte #82333-239): Brunschwig & Fils, 800/538-1880. Drapery trim (Wide Picot Braid"/Dark Blue #5026-01): Cowtan & Tout, 212/647-6900. Drapery hardware: JK Drapery, 703/941-3788. A view of the living room prior to the makeover. Interior designer Kelley Proxmire selected indoor/outdoor fabrics for the living room, then created interest by using florals, stripes, and contrasting piping and trim to twist the tried-and-true color scheme. "Blue-and-white isn't original, but it translates so beautifully," says Proxmire. "We played with scale on the fabrics and used mitered stripes so this version of blue-and-white would have its own signature." Furniture frames boast dark wood tones, a contrast to the crisp white woodwork and furniture in other main-level areas. Chairs ("Muji Lounge Chairs" #6103): Baker, 800/592-2537, bakerfurniture.com. Chair fabric ("Nautique Stripe"/Blue #50680): Schumacher, 800/523-1200, fschumacher.com. Sofa ("Lancaster Sofa" #8839): Rist Corp., 202/646-1540. Fabric ("Massimo Woven Texture"/Blue #89508-222, colorway discontinued): Brunschwig & Fils, 800/538-1880. brunschwig.com. Coffee table ("John Co. Bamboo Leg Coffee Table" #814, by British Khaki): British Khaki/Robert Lighton, 212/343-2299, britishkhaki.com. Lamps behind sofa ("Balustrade Bedside Lamp in Crystal" #CHA 8939CG): Visual Comfort & Co., 713/686-5999. Available through Circa Lighting, 877/762-2323, circalighting.com. Accent pillow on striped chair: discontinued. White trim (#32429-9001, discontinued): Houlès, 310/652-6171, houles.com. Blue trim ("Dorsett Gimp"/Indigo #39081-282): Brunschwig & Fils, 800/538-1880, brunschwig.com. Another view of the living room prior to the makeover. The kitchen's unusual shape prevented both an eating area and a working island, so Cheryl opted to combine the two. The white marble island top gets a sunny lift from French bar stools painted in blue and yellow and cushioned with checks of yellow and white. Cabinetry; range; refrigerator; backsplash; sink; faucet: Kitchen Encounters, 410/263-4900, kitchenencounters.biz. Lighting above island ("Sloane Street Shop Light Ceiling Mount Fixture"/Antique Nickel #CHC5101AN); shades (linen): Visual Comfort & Co., 713/686-5999. Through Circa Lighting, 877/762-2323. Counter stools ("Tuscan" #F0428, by Jane Keltner Designs): Brighton Pavilion, 800/487-8033, paintedfurniture.com. Seat fabric ("Bay"/Yellow, White #1-2537-148): JAB, 212/486-1500, jab.us. Cord trim on seat cushions ("Spring Lake Small Cord on Tape"/Buttercup #39091-303): Brunschwig & Fils, 800/538-1880. Pale-yellow walls frame a window seat where the kids can relax and talk to Cheryl while meals are prepared. Jillian the Shih Tzu obviously finds it a fine spot, too. Window-seat cushion, pillow ("Marguerite II"/Buttercup Bluebell #8812A-0110): Stroheim, 800/763-0524, stroheim.com. Cord trim (#31202-9666, discontinued): Houlès, 310/652-6171. Yellow-and-blue striped pillow ("Banana-Azure" #6553-26, colorway discontinued): B. Berger, 800/288-3586, bberger.com. Blue-and-white striped pillow ("On Deck"/Lagoon #25854-503): Kravet, 888/457-2838. Yellow paint ("Lemon Drops" #2019-50): Benjamin Moore & Co., 888/236-6667. In the dining area a window seat, with its Schumacher pillows and Cowtan & Tout cushion, offers additional seating--just the spot to dive into a good book or linger for a long conversation. Round table; chairs; chair-seat fabric: owner's collection. Paint on round table ("White Dove"): Benjamin Moore & Co., 888/236-6667. Chandelier ("Italian Chandelier, 12-arm"/Chalk Rust): Niermann Weeks, 212/319-7979, niermannweeks.com. Window shades ("Panama"/Bianco #84206-01); contrast fabric on valance ("Liso Jerez Woven"/Esmalte #82333-239): Brunschwig & Fils, 800/538-1880. Valance trim ("Wide Picot Braid"/Dark Blue #5026-01); window-seat cushion: discontinued. Cord trim on seat cushion (#31181-9696, discontinued): Houlès, 310/652-6171. Two-tone pillow fabric ("Arles"/Blue #F3323-01): Cowtan & Tout, 212/647-6900. Trim ("Bhutan"/12 inch): Fabricut, 800/999-8200. Fabric pillows ("Nautique Stripe"/Blue #50680): Schumacher, 800/523-1200, fschumacher.com. Area rug ("Conway"/sisal): Stark Carpet Corp., 212/752-9000, starkcarpet.com. The guest bedroom takes a formal turn with a regal brass chandelier and a checked canopy that adds height to the tufted white headboard. The pillows and duvet are covered in a pretty blue-and-white damask print. Headboard fabric ("Snow White" #3609-00); bed skirt and bed drapery lining ("Chambray" #3607-67): B. Berger, 800/288-3586, bberger.com. Blue-patterned pillow shams, bed cover, and chair fabric ("Sutton"/Blue #J376F-07, by Jane Churchill); checked bed drapery (discontinued); bed drapery trim; bed-skirt trim (discontinued): Cowtan & Tout, 212/647-6900. Wall paint: Fine Art Finishes, 202/544-3142. Ceiling and trim paint ("Dove White"): Benjamin Moore & Co., 888/236-6667. Drapery ("Belfast"/Off White, White #2896226): Fabricut, 800/999-8200. Trim ("Melissa Loop Fringe"/White, Periwinkle #LF22014/2): Schumacher, 800/523-1200, fschumacher.com. Upholstered chair ("Club Chair" #8210-00): The Charles Stewart Co., 828/322-9464. Chandelier (by Bella Figura): Lee Jofa, 800/453-3563. Bedside tables ("3-Tier Painted Rectangular End Tables with Blue Trim" #LE158PSR-BL): The Kellogg Collection, kelloggcollection.com. Table lamps ("Lilford Glass Urn" #GL16/BR); shade (#SCL/17-inch ACF in Cream Silk): Vaughan Designs, 212/319-7070, vaughandesigns.com. Carpet ("Erica"/French Blue): Stark Carpet Corp., 212/752-9000. Bedding: Susan Steele Embroidery, 301/765-0966. When the weather is temperate, the Rabbitt children travel to school via the family boat. Visitors ascend the white-painted stairs to reach the front door and screened porch. Bob and Cheryl Rabbitt and their children (from left) Ryan, 18, Olivia, 16, Alexandra, 14, Taylor, 12, and Jillian the Shih Tzu.